To register, simply JOIN US online. To become a member you’ll need to be over 21yrs, and have held a full valid driver license for 3yrs. Once approved we’ll send you a Yoogo Share Card to access our 100% electric Hyundai Ioniqs & BMW i3s. Book a car online or via our app for as long as you need. 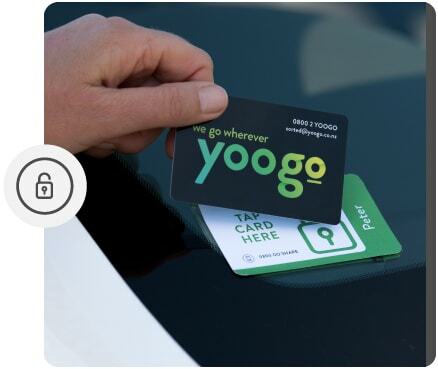 Unlock with your Yoogo Share Access Card. (Keep this card with you at all times as you’ll need it to lock/unlock the car and end your booking). Get going. Just remember to bring our car back to the same hub when you’re done. Drop the car back to the hub you got it from and plug it in to charge. Lock the car and tap your access card on the charger, to end your booking. Proudly powered by Meridian in Christchurch. Thanks! You've just done your part in building a more sustainable NZ. WHERE CAN I CHARGE IF I TRAVEL OUT OF THE CITY? 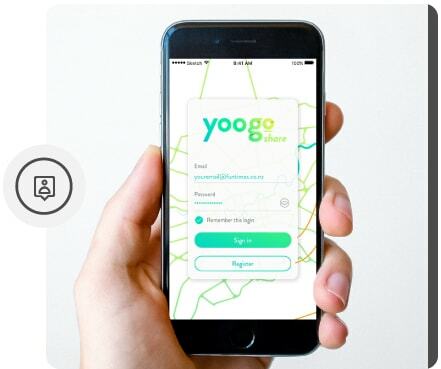 WHO CAN JOIN YOOGO SHARE? WHY DOES THE CAR FEEL LIKE ITS BRAKING WHEN I TAKE MY FOOT OFF THE ACCELERATOR? WHAT ARE THE INSURANCE COSTS? Want to get a first-hand demonstration on how to book, drive and charge Yoogo Share electric cars? We hold training sessions every Friday morning - To see where the next training session is being held, view our Facebook Events page.